Excelsior, Minnesota is home to Minnesota’s second operating streetcar line (part of the Minnesota Streetcar Museum). Being good transportationists, we visited a few weeks ago. 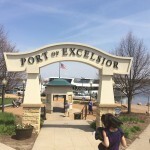 Excelsior is legally a city, though really a town, with about 2400 people. Excelsior is coated about 20 miles southwest of Minneapolis (map), connected directly by Mn 7, and more circuitously by Excelsior Boulevard (County 3). Though the town’s population is small, it possesses a main street (Water Street) that serves a larger market area, though the businesses are clearly appealing to those with some accumulated capital (flickr). The area was developed in part by Twin City Rapid Transit, back in the day, when it extended its line here as a terminus, aiming for both weekday and weekend service, the latter to try to attract reverse direction (outbound) weekend flows for people seeking a summer holiday in this lakeside town. Lake Minnetonka is a huge attraction, and TCRT constructed Big Island Amusement park nearby, connected by TCRT ferry. Unfortunately for Tom Lowry and company, this venture only lasted from 1906-1911. Another entrepreneur, Fred Pearce, was more successful on a mainland site, as the Excelsior Amusement Park lasted from 1925-1973, before the owners migrated southward to Valleyfair. Today Water Street retains the common features of late 19th/early 20th century streetcar nodes and main streets, a good frontage of retail activity for several blocks. There is on-street parking, with far more parking around the back. Water Street naturally enough leads to the Lake, which is pleasant to look at, and I am sure pleasant to boat on. (I don’t really have much to say about maritime transportation). 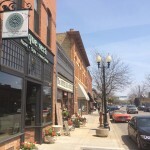 It is well-maintained and fixed up, with the all important streetlights, but more importantly, fully occupied, which is more than can be said for some main streets in Greater Minnesota. The main downside is that the developed area is fairly small, which is a shame, for there is far more retail activity in and around Lake Minnetonka in much less pleasant designs. 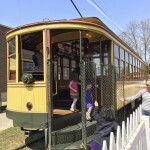 The Streetcar Museum (which is basically a trolley ride plus the shops) is well worth the $2 admission. 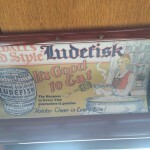 My favorite part are the ads on the interior of the streetcar (among them, promoting Ludefisk).